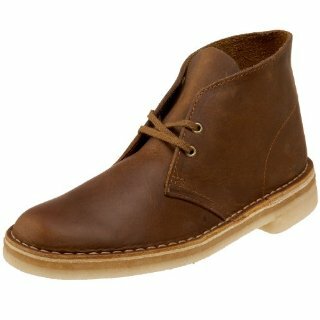 For a sophisticated shoe that is sure to be a constant in your life, the Men's Clarks Desert Boot Casual Boots are a timeless classic for casual and dressed up attire. The lace-up style is unique with only two lace holes, and allows for a perfectly adjustable fit. The unlined full grain leather uppers are soft and breathable while the suede-lined counter promotes heel stability and everyday natural comfort. A nature-formed last allows your toes to breathe and spread out while the leather-covered EVA footbed helps keep feet dry and comfortable for those extra long days when they don't get to rest. Store: Shoes.com Condition: Brand New Price: $129.95 Total Price: $129.95 Buy It from Shoes.com 6 Color Options! Clarks Desert Boot - Men's -- Free 2-day Shipping On $50+ Orders! Last updated: April 20, 2019 at 11:57 EST. Pricing information is provided by the listed merchants. GoSale.com is not responsible for the accuracy of pricing information, product information or the images provided. Product prices and availability is subject to change. Any price and availability information displayed on amazon.com or other merchants at the time of purchase will apply to the purchase of the product. As always, be sure to visit the merchant's site to review and verify product information, price, and shipping costs. GoSale.com is not responsible for the content and opinions contained in customer submitted reviews.